This article is about the language called Turkish. It is not to be confused with Turkic languages. 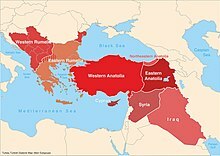 Turkish ( Türkçe (help·info)), also referred to as Istanbul Turkish, is the most widely spoken of the Turkic languages, with around ten to fifteen million native speakers in Southeast Europe (mostly in East and Western Thrace) and sixty to sixty-five million native speakers in Western Asia (mostly in Anatolia). Outside Turkey, significant smaller groups of speakers exist in Germany, Bulgaria, North Macedonia, Northern Cyprus, Greece, the Caucasus, and other parts of Europe and Central Asia. Cyprus has requested that the European Union add Turkish as an official language, even though Turkey is not a member state. To the west, the influence of Ottoman Turkish—the variety of the Turkish language that was used as the administrative and literary language of the Ottoman Empire—spread as the Ottoman Empire expanded. 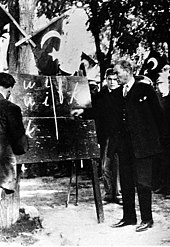 In 1928, as one of Atatürk's Reforms in the early years of the Republic of Turkey, the Ottoman Turkish alphabet was replaced with a Latin alphabet. The distinctive characteristics of the Turkish language are vowel harmony and extensive agglutination. The basic word order of Turkish is subject–object–verb. Turkish has no noun classes or grammatical gender. The language has a strong T–V distinction and usage of honorifics. Turkish uses second-person pronouns that distinguish varying levels of politeness, social distance, age, courtesy or familiarity toward the addressee. The plural second-person pronoun and verb forms are used referring to a single person out of respect. About 40% of all speakers of Turkic languages are native Turkish speakers.The characteristic features of Turkish, such as vowel harmony, agglutination, and lack of grammatical gender, are universal within the Turkic family. The Turkic family comprises some 30 living languages spoken across Eastern Europe, Central Asia, and Siberia. Turkish is a member of the Oghuz group of languages, a subgroup of the Turkic language family. There is a high degree of mutual intelligibility between Turkish and the other Oghuz Turkic languages, including Azerbaijani, Turkmen, Qashqai, Gagauz, and Balkan Gagauz Turkish. The Turkic languages were grouped into the now discredited Altaic language group. The earliest known Old Turkic inscriptions are the three monumental Orkhon inscriptions found in modern Mongolia. Erected in honour of the prince Kul Tigin and his brother Emperor Bilge Khagan, these date back to the second Turk Kaghanate. After the discovery and excavation of these monuments and associated stone slabs by Russian archaeologists in the wider area surrounding the Orkhon Valley between 1889 and 1893, it became established that the language on the inscriptions was the Old Turkic language written using the Old Turkic alphabet, which has also been referred to as "Turkic runes" or "runiform" due to a superficial similarity to the Germanic runic alphabets. With the Turkic expansion during Early Middle Ages (c. 6th–11th centuries), peoples speaking Turkic languages spread across Central Asia, covering a vast geographical region stretching from Siberia and to Europe and the Mediterranean. The Seljuqs of the Oghuz Turks, in particular, brought their language, Oghuz—the direct ancestor of today's Turkish language—into Anatolia during the 11th century. Also during the 11th century, an early linguist of the Turkic languages, Mahmud al-Kashgari from the Kara-Khanid Khanate, published the first comprehensive Turkic language dictionary and map of the geographical distribution of Turkic speakers in the Compendium of the Turkic Dialects (Ottoman Turkish: Divânü Lügati't-Türk). Following the adoption of Islam c. 950 by the Kara-Khanid Khanate and the Seljuq Turks, who are both regarded as the ethnic and cultural ancestors of the Ottomans, the administrative language of these states acquired a large collection of loanwords from Arabic and Persian. Turkish literature during the Ottoman period, particularly Divan poetry, was heavily influenced by Persian, including the adoption of poetic meters and a great quantity of imported words. The literary and official language during the Ottoman Empire period (c. 1299–1922) is termed Ottoman Turkish, which was a mixture of Turkish, Persian, and Arabic that differed considerably and was largely unintelligible to the period's everyday Turkish. The everyday Turkish, known as kaba Türkçe or "rough Turkish", spoken by the less-educated lower and also rural members of society, contained a higher percentage of native vocabulary and served as basis for the modern Turkish language. After the foundation of the modern state of Turkey and the script reform, the Turkish Language Association (TDK) was established in 1932 under the patronage of Mustafa Kemal Atatürk, with the aim of conducting research on Turkish. One of the tasks of the newly established association was to initiate a language reform to replace loanwords of Arabic and Persian origin with Turkish equivalents. By banning the usage of imported words in the press, the association succeeded in removing several hundred foreign words from the language. While most of the words introduced to the language by the TDK were newly derived from Turkic roots, it also opted for reviving Old Turkish words which had not been used for centuries. nispet oran ratio The old word is still used in the language today together with the new one. The modern word is from the Old Turkic verb or- (to cut). Turkish is natively spoken by the Turkish people in Turkey and by the Turkish diaspora in some 30 other countries. Turkish language is mutually intelligible with Azerbaijani and other Turkic languages. In particular, Turkish-speaking minorities exist in countries that formerly (in whole or part) belonged to the Ottoman Empire, such as Iraq, Bulgaria, Cyprus, Greece (primarily in Western Thrace), the Republic of North Macedonia, Romania, and Serbia. More than two million Turkish speakers live in Germany; and there are significant Turkish-speaking communities in the United States, France, The Netherlands, Austria, Belgium, Switzerland, and the United Kingdom. Due to the cultural assimilation of Turkish immigrants in host countries, not all ethnic Turkish immigrants speak the language with native fluency. In 2005, 93% of the population of Turkey were native speakers of Turkish, about 67 million at the time, with Kurdish languages making up most of the remainder. However, most linguistic minorities in Turkey are bilingual, speaking Turkish with native-like fluency. Road signs in Prizren, Kosovo. Official languages are: Albanian (top), Serbian (middle) and Turkish (bottom). Turkish is the official language of Turkey and is one of the official languages of Cyprus. Turkish has official status in 38 municipalities in Kosovo, including Mamusha, and two in the Republic of North Macedonia. Map of the main subgroups of Turkish dialects across Southeast Europe and the Middle East. Modern standard Turkish is based on the dialect of Istanbul. This "Istanbul Turkish" (İstanbul Türkçesi) constitutes the model of written and spoken Turkish, as recommended by Ziya Gökalp, Ömer Seyfettin and others. Dialectal variation persists, in spite of the levelling influence of the standard used in mass media and the Turkish education system since the 1930s. Academically, researchers from Turkey often refer to Turkish dialects as ağız or şive, leading to an ambiguity with the linguistic concept of accent, which is also covered with these words. Projects investigating Turkish dialects are being carried out by several universities, as well as a dedicated work group of the Turkish Language Association. Work is currently in progress for the compilation and publication of their research as a comprehensive dialect atlas of the Turkish language. Rumelice is spoken by immigrants from Rumelia, and includes the distinct dialects of Ludogorie, Dinler, and Adakale, which are influenced by the theoretized Balkan sprachbund. 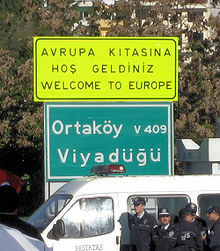 Kıbrıs Türkçesi is the name for Cypriot Turkish and is spoken by the Turkish Cypriots. Edirne is the dialect of Edirne. Ege is spoken in the Aegean region, with its usage extending to Antalya. The nomadic Yörüks of the Mediterranean Region of Turkey also have their own dialect of Turkish. This group is not to be confused with the Yuruk nomads of Macedonia, Greece, and European Turkey who speak Balkan Gagauz Turkish. Güneydoğu is spoken in the southeast, to the east of Mersin. Doğu, a dialect in the Eastern Anatolia Region, has a dialect continuum. The Meskhetian Turks who live in Kazakhstan, Azerbaijan and Russia as well as in several Central Asian countries, also speak an Eastern Anatolian dialect of Turkish, originating in the areas of Kars, Ardahan, and Artvin and sharing similarities with Azerbaijani, the language of Azerbaijan. The Central Anatolia Region speaks Orta Anadolu. Karadeniz, spoken in the Eastern Black Sea Region and represented primarily by the Trabzon dialect, exhibits substratum influence from Greek in phonology and syntax; it is also known as Laz dialect (not to be confused with the Laz language). Kastamonu is spoken in Kastamonu and its surrounding areas. Karamanli Turkish is spoken in Greece, where it is called Kαραμανλήδικα. It is the literary standard for the Karamanlides. At least one source claims Turkish consonants are larengially specified three-way fortis-lenis (aspirated/neutral/voiced) like Armenian. The phoneme that is usually referred to as yumuşak g ("soft g"), written ⟨ğ⟩ in Turkish orthography, represents a vowel sequence or a rather weak bilabial approximant between rounded vowels, a weak palatal approximant between unrounded front vowels, and a vowel sequence elsewhere. It never occurs at the beginning of a word or a syllable, but always follows a vowel. When word-final or preceding another consonant, it lengthens the preceding vowel. Turkish orthography reflects final-obstruent devoicing, a form of consonant mutation whereby a voiced obstruent, such as /b d dʒ ɡ/, is devoiced to [p t tʃ k] at the end of a word or before a consonant, but retains its voicing before a vowel. In loan words, the voiced equivalent of /k/ is /g/; in native words, it is /ğ/. The vowels of the Turkish language are, in their alphabetical order, ⟨a⟩, ⟨e⟩, ⟨ı⟩, ⟨i⟩, ⟨o⟩, ⟨ö⟩, ⟨u⟩, ⟨ü⟩. The Turkish vowel system can be considered as being three-dimensional, where vowels are characterised by how and where they are articulated focusing on three key features: front and back, rounded and unrounded and vowel height. Vowels are classified [±back], [±round] and [±high]. The only diphthongs in the language are found in loanwords and may be categorised as falling diphthongs usually analyzed as a sequence of /j/ and a vowel. Turkish is an agglutinative language where a series of suffixes are added to the stem word; vowel harmony is a phonological process which ensures a smooth flow, requiring the least amount of oral movement as possible. Vowel harmony can be viewed as a process of assimilation, whereby following vowels take on the characteristics of the preceding vowel. It may be useful to think of Turkish vowels as two symmetrical sets: the a-undotted (a, ı, o, u) which are all back vowels, articulated at the back of the mouth; and the e-dotted (e, i, ö, ü) vowels which are articulated at the front of the mouth. The place and manner of articulation of the vowels will determine which pattern of vowel harmony a word will adopt. The pattern of vowels is shown in the table above. twofold (-e/-a): the locative case suffix, for example, is -de after front vowels and -da after back vowels. The notation -de² is a convenient shorthand for this pattern. fourfold (-i/-ı/-ü/-u): the genitive case suffix, for example, is -in or -ın after unrounded vowels (front or back respectively); and -ün or -un after the corresponding rounded vowels. In this case, the shorthand notation -in4 is used. Practically, the twofold pattern (also referred to as the e-type vowel harmony) means that in the environment where the vowel in the word stem is formed in the front of the mouth, the suffix will take the e-form, while if it is formed in the back it will take the a-form. The fourfold pattern (also called the i-type) accounts for rounding as well as for front/back. The following examples, based on the copula -dir4 ("[it] is"), illustrate the principles of i-type vowel harmony in practice: Türkiye'dir ("it is Turkey"), kapıdır ("it is the door"), but gündür ("it is the day"), paltodur ("it is the coat"). A few native root words such as anne (mother), elma (apple) and kardeş (brother). In these cases the suffixes harmonise with the final vowel. Compounds such as the bu-gün (today) and baş-kent (capital). In these cases vowels are not required to harmonise between the constituent words. Loanwords often don't harmonise, however, in some cases the suffixes will harmonise with the front vowel even in words that may not have a front vowel in the final syllable. Usually this occurs when the words end in a palatal [l], for example halsiz < hal + -siz "listless", meçhuldür < meçhul + -dir "it is unknown". However, affixes borrowed from foreign languages do not harmonise, such as -izm (ateizm "atheism"), -en (derived from French -ment as in taxmen "completely), anti- (antidemokratik "antidemocratic"). Some rural dialects lack some or all of these exceptions mentioned above. The rules of vowel harmony may vary by regional dialect. The dialect of Turkish spoken in the Trabzon region of northeastern Turkey follows the reduced vowel harmony of Old Anatolian Turkish, with the additional complication of two missing vowels (ü and ı), thus there is no palatal harmony. It's likely that elün meant "your hand" in Old Anatolian. While the 2nd person singular possessive would vary between back and front vowel, -ün or -un, as in elün for "your hand" and kitabun for "your book", the lack of ü vowel in the Trabzon dialect means -un would be used in both of these cases — elun and kitabun. In addition, there are certain suffixes such as -le "with" and the verbal negative particle -me-/-ma-, which place an accent on the syllable which precedes them, e.g. kitáp-la "with the book", dé-me-mek "not to say". In some circumstances (for example, in the second half of compound words or when verbs are preceded by an indefinite object) the accent on a word is suppressed and cannot be heard. The two groups of sentences have different ways of forming negation. A nominal sentence can be negated with the addition of the word değil, for example the sentence above would become Necla oğretmen değil (Necla is not a teacher). However, the verbal sentence requires the addition of a negative suffix -me to the verb (the suffix comes after the stem but before the tense): Necla okula gitmedi (Necla did not go to school). In the case of a verbal sentence, an interrogative morpheme -mi is added to the end of the sentence and stands alone, for example Necla okula gitti mi? (Did Necla go to school?). In the case of a nominal sentence, then the -mi comes after the predicate but before the personal ending, so for example Necla, siz oğretmen misiniz? (Necla, are you a teacher? using the formal 2nd person plural). Word order in simple Turkish sentences is generally subject–object–verb, as in Korean and Latin, but unlike English, for verbal sentences and subject-predicate for nominal sentences. However, as Turkish possesses a case-marking system, and most grammatical relations are shown using morphological markers, often the SOV structure has diminished relevance, in fact it may be considered a "pragmatic word order" of language, one that does not rely on word order for grammatical purposes. While the basic word order in Turkish is firmly SOV, the word order may vary in particular conditions. There has been some debate among linguists whether Turkish is a subject-prominent (like English) or topic-prominent (like Japanese and Korean) language, with recent scholarship implying that it is indeed both subject and topic-prominent. This has direct implications for word order as it is possible for the subject to be included in the verb-phrase in Turkish. There can be S/O inversion in sentences where the topic is of greater importance than the subject. The extensive use of affixes can give rise to long words, e.g. Çekoslovakyalılaştıramadıklarımızdanmışsınızcasına, meaning "In the manner of you being one of those that we apparently couldn't manage to convert to Czechoslovakian". While this case is contrived, long words frequently occur in normal Turkish, as in this heading of a newspaper obituary column: Bayramlaşamadıklarımız (Bayram [festival]-Recipr-Impot-Partic-Plur-PossPl1; "Those of our number with whom we cannot exchange the season's greetings"). Another example can be seen in the final word of this heading of the online Turkish Spelling Guide (İmlâ Kılavuzu): Dilde birlik, ulusal birliğin vazgeçilemezlerindendir ("Unity in language is among the indispensables [dispense-Pass-Impot-Plur-PossS3-Abl-Copula] of national unity ~ Linguistic unity is a sine qua non of national unity"). There is no definite article in Turkish, but definiteness of the object is implied when the accusative ending is used (see below). Turkish nouns decline by taking case endings. There are six noun cases in Turkish, with all the endings following vowel harmony (shown in the table using the shorthand superscript notation. The plural marker -ler ² immediately follows the noun before any case or other affixes (e.g. köylerin "of the villages"). The accusative case marker is used only for definite objects; compare (bir) ağaç gördük "we saw a tree" with ağacı gördük "we saw the tree". The plural marker -ler ² is generally not used when a class or category is meant: ağaç gördük can equally well mean "we saw trees [as we walked through the forest]"—as opposed to ağaçları gördük "we saw the trees [in question]". Additionally, nouns can take suffixes that assign person: for example -imiz 4, "our". With the addition of the copula (for example -im 4, "I am") complete sentences can be formed. The interrogative particle mi 4 immediately follows the word being questioned: köye mi? "[going] to the village? ", ağaç mı? "[is it a] tree?". The Turkish personal pronouns in the nominative case are ben (1s), sen (2s), o (3s), biz (1pl), siz (2pl, or 2h), and onlar (3pl). They are declined regularly with some exceptions: benim (1s gen.); bizim (1pl gen.); bana (1s dat. ); sana (2s dat. ); and the oblique forms of o use the root on. All other pronouns (reflexive kendi and so on) are declined regularly. (Note. For the sake of simplicity the term "tense" is used here throughout, although for some forms "aspect" or "mood" might be more appropriate.) There are 9 simple and 20 compound tenses in Turkish. 9 simple tenses are simple past (di'li geçmiş), inferential past (miş'li geçmiş), present continuous, simple present (aorist), future, optative, subjunctive, necessitative ("must") and imperative. There are three groups of compound forms. Story (hikaye) is the witnessed past of the above forms (except command), rumor (rivayet) is the unwitnessed past of the above forms (except simple past and command), conditional (koşul) is the conditional form of the first five basic tenses. In the example below the second person singular of the verb gitmek ("go"), stem gid-/git-, is shown. There are also so-called combined verbs, which are created by suffixing certain verb stems (like bil or ver) to the original stem of a verb. Bil is the suffix for the sufficiency mood. It is the equivalent of the English auxiliary verbs "able to", "can" or "may". Ver is the suffix for the swiftness mood, kal for the perpetuity mood and yaz for the approach ("almost") mood. Thus, while gittin means "you went", gidebildin means "you could go" and gidiverdin means "you went swiftly". The tenses of the combined verbs are formed the same way as for simple verbs. Turkish verbs have attributive forms, including present, similar to the English present participle (with the ending -en2); future (-ecek2); indirect/inferential past (-miş4); and aorist (-er2 or -ir4). These forms can function as either adjectives or nouns: oynamayan çocuklar "children who do not play", oynamayanlar "those who do not play"; okur yazar "reader-writer = literate", okur yazarlar "literates". The most important function of some of these attributive verbs is to form modifying phrases equivalent to the relative clauses found in most European languages. The subject of the verb in an -en2 form is (possibly implicitly) in the third person (he/she/it/they); this form, when used in a modifying phrase, does not change according to number. The other attributive forms used in these constructions are the future (-ecek2) and an older form (-dik4), which covers both present and past meanings. These two forms take "personal endings", which have the same form as the possessive suffixes but indicate the person and possibly number of the subject of the attributive verb; for example, yediğim means "what I eat", yediğin means "what you eat", and so on. The use of these "personal or relative participles" is illustrated in the following table, in which the examples are presented according to the grammatical case which would be seen in the equivalent English relative clause. Turkish now has an alphabet suited to the sounds of the language: the spelling is largely phonemic, with one letter corresponding to each phoneme. Most of the letters are used approximately as in English, the main exceptions being ⟨c⟩, which denotes [dʒ] (⟨j⟩ being used for the [ʒ] found in Persian and European loans); and the undotted ⟨ı⟩, representing [ɯ]. As in German, ⟨ö⟩ and ⟨ü⟩ represent [ø] and [y]. The letter ⟨ğ⟩, in principle, denotes [ɣ] but has the property of lengthening the preceding vowel and assimilating any subsequent vowel. The letters ⟨ş⟩ and ⟨ç⟩ represent [ʃ] and [tʃ], respectively. A circumflex is written over back vowels following ⟨k⟩, ⟨g⟩, or ⟨l⟩ when these consonants represent [c], [ɟ], and [l]—almost exclusively in Arabic and Persian loans. An apostrophe is used to separate proper nouns from inflectional suffixes: e.g. İstanbul'da "in Istanbul"' (but not from derivational suffixes since 2009 spelling revision by TDK, e.g. İstanbullu "from/of Istanbul"). In the Turkish province of Giresun, the locals in the village of Kuşköy have communicated using a whistled version of Turkish for over 400 years. The region consists of a series of deep valleys and the unusual mode of communication allows for conversation over distances of up to 5 kilometres. Turkish authorities estimate that there are still around 10,000 people using the whistled language. However, in 2011 UNESCO found whistling Turkish to be a dying language and included it in its intangible cultural heritage list. Since then the local education directorate has introduced it as a course in schools in the region, hoping to revive its use. A study was conducted by a German scientist of Turkish origin Onur Güntürkün at Ruhr University, observing 31 "speakers" of kuş dili ("bird's tongue") from Kuşköy, and he found that the whistled language mirrored the lexical and syntactical structure of Turkish language. ^ Kuribayashi, Yuu (2012). "Transitivity in Turkish: A study of valence orientation" (PDF). Asian and African Languages and Linguistics. 7: 39–51. ^ Hammarström, Harald; Forkel, Robert; Haspelmath, Martin, eds. (2017). "Turkish". Glottolog 3.0. Jena, Germany: Max Planck Institute for the Science of Human History. ^ ""İstanbul Türkçesi" konulu deneme yarışması ödül töreni". Turkish Language Association (in Turkish). ^ Boeschoten, Henrik. Turkic Languages in Contact. ^ "Cyprus". Encyclopedia Britannica. 2016. ^ "The Muslim Minority of Greek Thrace". Archived from the original on 2017-07-01. ^ Katzner, Kenneth (2002). Languages of the World (Third ed.). Routledge. ISBN 978-0-415-25004-7. ^ "Language Materials Project: Turkish". UCLA International Institute, Center for World Languages. February 2007. Retrieved 2007-04-26. ^ Erdal, Marcel (March 2004). A Grammar Of Old Turkic. ^ "A Database of Turkic Runiform Inscriptions". ^ See Lewis (2002) for a thorough treatment of the Turkish language reform. ^ a b Turkish Language Association. "Türk Dil Kurumu – Tarihçe (History of the Turkish Language Association)" (in Turkish). Archived from the original on March 16, 2007. Retrieved 2007-03-18. ^ See Lewis (2002): 2–3 for the first two translations. For the third see Bedi Yazıcı. "Nutuk: Özgün metin ve çeviri (Atatürk's Speech: original text and translation)" (in Turkish). Retrieved 2007-09-28. ^ "Öz Türkçeleştirme Çalışmaları". Çok Bilgi. Retrieved 29 May 2014. ^ Mütercim Asım (1799). Burhân-ı Katı Tercemesi (in Turkish). İstanbul. ^ "Iraq". Encyclopedia Britannica. 2016. ^ e.g. citations given in Cindark, Ibrahim/Aslan, Sema (2004): Deutschlandtürkisch?. Institut für Deutsche Sprache, page 3. ^ European Commission (2006). "Special Eurobarometer 243: Europeans and their Languages (Survey)" (PDF). Europa. Retrieved 2010-02-14. ^ "Kosovo". Encyclopedia Britannica. 2016. ^ "Kosovo starts using Turkish as fifth official language in documents". ^ "Official regional languages". CIA World Factbook. 2002. Retrieved 2016-02-10. ^ The name TDK itself exemplifies this process. The words tetkik and cemiyet in the original name are both Arabic loanwords (the final -i of cemiyeti being a Turkish possessive suffix); kurum is a native Turkish word based on the verb kurmak, "set up, found". ^ Campbell, George (1995). "Turkish". Concise compendium of the world's languages. London: Routledge. p. 547. ^ "En iyi İstanbul Türkçesini kim konuşur?". Milliyet. Retrieved 2017-12-30. ^ Akalın, Şükrü Halûk (January 2003). "Türk Dil Kurumu'nun 2002 yılı çalışmaları (Turkish Language Association progress report for 2002)" (PDF). Türk Dili (in Turkish). 85 (613). ISSN 1301-465X. Archived from the original (PDF) on June 27, 2007. Retrieved 2007-03-18. ^ Shashi, Shyam Singh (1992). Encyclopaedia of Humanities and Social Sciences. Anmol Publications. p. 47. Retrieved 2008-03-26. ^ Brendemoen, B. (1996). "Conference on Turkish in Contact, Netherlands Institute for Advanced Study (NIAS) in the Humanities and Social Sciences, Wassenaar, 5–6 February 1996". ^ Balta, Evangelia (Fall 2017). "TRANSLATING BOOKS FROM GREEK INTO TURKISH FOR THE KARAMANLI ORTHODOX CHRISTIANS OF ANATOLIA (1718-1856)". International Journal of Turkish Studies. 23(1-2): 20 – via Ebsco. ^ Petrova, Olga; Plapp, Rosemary; Ringen, Catherine; Szentgyörgyi, Szilárd (2006). "Voice and aspiration: Evidence from Russian, Hungarian, German, Swedish, and Turkish" (PDF). The Linguistic Review. 23 (1): 1–35. doi:10.1515/tlr.2006.001. ISSN 0167-6318. ^ "Sesler ve ses uyumları "Sounds and Vovel karmony"" (in Turkish). Turkish Language Association. Retrieved 2013-01-13. ^ "Turkish Consonant Mutation". turkishbasics.com. ^ The vowel represented by ⟨ı⟩ is also commonly transcribed as ⟨ɨ⟩ in linguistic literature. ^ a b Goksel, Asli; Kerslake, Celia (2005). Turkish: A Comprehensive Grammar. Routledge. pp. 24–25. ISBN 0-415-11494-2. ^ Khalilzadeh, Amir (Winter 2010). "Vowel Harmony in Turkish". Karadeniz Araştırmaları: Balkan, Kafkas, Doğu Avrupa ve Anadolu İncelemeleri Dergisi. 6(24): 141–150 – via Central and Eastern European Online Library. ^ a b Underhill, Robert (1976). Turkish Grammar. Cambridge, Massachusetts: The MIT Press. p. 25. ISBN 0-262-21006-1. ^ Note that this table is essentially the same as the IPA vowel chart shown above: both table and chart indicate the physical location and quality of each vowel. However, the second table includes additional information on how Turkish harmonies vowels sounds across syllables based on the physical location and quality of the initial syllable. ^ For the terms twofold and fourfold, as well as the superscript notation, see Lewis (1953):21–22. In his more recent works Lewis prefers to omit the superscripts, on the grounds that "there is no need for this once the principle has been grasped" (Lewis :18). ^ In modern Turkish orthography, an apostrophe is used to separate proper names from any suffixes. ^ Husby, Olaf. "Diagnostic use of nonword repetition for detection of language impairment among Turkish speaking minority children in Norway". Working Papers Department of Language and Communication Studies NTNV. 3/2006: 139–149 – via Academia.edu. ^ Boeschoten, Hendrik; Johanson, Lars; Milani, Vildan (2006). Turkic Languages in Contact. Otto Harrassowitz Verlag. ISBN 978-3-447-05212-2. ^ Levi, Susannah V. (2005). "Acoustic correlates of lexical accent in Turkish". Journal of the International Phonetic Association. 35 (1): 76. doi:10.1017/S0025100305001921. ^ a b Goksel, Asli; Kerslake, Celia (2005). Turkish: A Comprehensive Grammar. Routledge. ISBN 0-415-11494-2. ^ a b Underhill, Robert (1976). Turkish Grammar. Cambridge, Massachusetts: The MIT Press. ISBN 0-262-21006-1. ^ Thompson, Sandra (April 1978). "Modern English from a Typological Point of View: Some Implications of the Function of Word Order". Linguistische Berlichte. 1978(54): 19–35 – via ProQuest. ^ Erguvanlı, Eser Emine (1984). The Function of Word Order in Turkish Grammar. Linguistics Vol. 106. Berkeley: University of California Press. ISBN 0-520-09955-9. ^ Kiliçasaslan, Yılmaz. "A Typological Approach to Sentence Structure in Turkish" (PDF). ^ This section draws heavily on Lewis (2001) and, to a lesser extent, Lewis (1953). Only the most important references are specifically flagged with footnotes. ^ see Lewis (2001) Ch XIV. ^ "The prefix, which is accented, is modelled on the first syllable of the simple adjective or adverb but with the substitution of m, p, r, or s for the last consonant of that syllable." Lewis (2001):55. The prefix retains the first vowel of the base form and thus exhibits a form of reverse vowel harmony. ^ This "splendid word" appeared at the time of Bayram, the festival marking the end of the month of fasting. Lewis (2001):287. ^ "İmlâ Kilavuzu". Dilimiz.com. Retrieved 2011-11-03. ^ Because it is also used for the indefinite accusative, Lewis uses the term "absolute case" in preference to "nominative". Lewis (2001):28. ^ Lewis points out that "an indefinite izafet group can be turned into intelligible (though not necessarily normal) English by the use of a hyphen". Lewis (2001): 42. ^ The examples are taken from Lewis (2001): 41–47. ^ For other possible permutations of this vehicle, see Lewis (2001):46. ^ "It is most important to note that the third-person suffix is not repeated though theoretically one might have expected Ankara [Kız Lisesi]si." Lewis (2001): 45 footnote. ^ Note the similarity with the French phrase un m'as-tu-vu "a have-you-seen-me? ", i.e., a vain and pretentious person. ^ The term substantival sentence is Lewis's. Lewis(2001:257). ^ "Journal of Turkish World Studies (be celal Demir)" (PDF) (in Turkish). Retrieved 2013-03-29. ^ "Turkish Studies Vol 7/3" (PDF) (in Turkish). Retrieved 2013-03-29. ^ "Dersimiz Edebiyat Online course" (in Turkish). Dersimizedebiyat.com. Retrieved 2013-03-29. ^ The conventional translation of the film title Dünyayı Kurtaran Adam, The Man Who Saved the World, uses the past tense. Semantically, his saving the world takes place though in the (narrative) present. ^ See Lewis (2001):163–165, 260–262 for an exhaustive treatment. ^ For the terms personal and relative participle see Lewis (1958):98 and Lewis (2001):163 respectively. Most of the examples are taken from Lewis (2001). ^ This more complex example from Orhan Pamuk's Kar (Snow) contains a nested structure: [which he knew [were approaching]]. Maureen Freely's more succinct and idiomatic translation is the days in prison he knew lay ahead. Note that Pamuk uses the spelling hapisane. ^ From the perspective of Turkish grammar yaklaştığını anladığı is exactly parallel to babasını gördüğüm ("whose father I saw"), and could therefore be paraphrased as "whose approaching he understood". ^ "Büyük Türkçe Sözlük Turkish Language Association" (in Turkish). Tdkterim.gov.tr. Archived from the original on 2013-03-28. Retrieved 2013-03-29. ^ "Güncel Türkçe Sözlük" (in Turkish). Turkish Language Association. 2005. Archived from the original on March 21, 2007. Retrieved 2007-03-21. ^ "Türkçe Sözlük (2005)'teki Sözlerin Kökenlerine Ait Sayısal Döküm (Numerical list on the origin of words in Türkçe Sözlük (2005))" (in Turkish). Turkish Language Association. 2005. Archived from the original on March 1, 2007. Retrieved 2007-03-21. ^ Goksel, Asli; Kerslake, Celia (2005). Turkish: A Comprehensive Grammar. Routledge. pp. 43–48. ISBN 0-415-11494-2. ^ Dilaçar, Agop (1977). "Atatürk ve Yazım". Türk Dili (in Turkish). 35 (307). ISSN 1301-465X. Retrieved 2007-03-19. ^ In modern Turkish spelling: elma ağaçtan ırak düşmez. ^ Celia Kerslake; Asli Goksel (11 June 2014). Turkish: An Essential Grammar. Routledge. p. 12. ISBN 978-1-134-04218-0. ^ Lewis (2001):3–7. Note that in these cases the circumflex conveys information about the preceding consonant rather than the vowel over which it is written. ^ "Northern village of Kuşköy still communicates with amazing Turkish whistling language". The Daily Sabah. February 16, 2016. Akalın, Şükrü Haluk (January 2003). "Türk Dil Kurumu'nun 2002 yılı çalışmaları (Turkish Language Association progress report for 2002)" (PDF). Türk_Dili (in Turkish). 85 (613). ISSN 1301-465X. Archived from the original (PDF) on June 27, 2007. Retrieved 2007-03-18. Bazin, Louis (1975). "Turcs et Sogdiens: Les Enseignements de L'Inscription de Bugut (Mongolie), Mélanges Linguistiques Offerts à Émile Benveniste". Collection Linguistique, publiée par la Société de Linguistique de Paris (in French) (LXX): 37–45. Brendemoen, B. (1996). "Conference on Turkish in Contact, Netherlands Institute for Advanced Study (NIAS) in the Humanities and Social Sciences, Wassenaar, 5–6 February 1996". Encyclopaedia Britannica, Expo 70 Edition Vol 12. William Benton. 1970. Coulmas, Florian (1989). Writing Systems of the World. Blackwell Publishers Ltd, Oxford. ISBN 0-631-18028-1. Dilaçar, Agop (1977). "Atatürk ve Yazım". Türk Dili (in Turkish). 35 (307). ISSN 1301-465X. Retrieved 2007-03-19. Ergin, Muharrem (1980). Orhun Abideleri (in Turkish). Boğaziçi Yayınları. ISBN 0-19-517726-6. Findley, Carter V. (October 2004). The Turks in World History. Oxford University Press. ISBN 0-19-517726-6. Glenny, Misha (2001). The Balkans: Nationalism, War, and the Great Powers, 1804-1999. New York: Penguin. Johanson, Lars (2001). "Discoveries on the Turkic linguistic map" (PDF). Swedish Research Institute in Istanbul. Archived from the original (PDF) on February 5, 2007. Retrieved 2007-03-18. Ishjatms, N. (October 1996). "Nomads In Eastern Central Asia". History of civilizations of Central Asia. 2. UNESCO Publishing. ISBN 92-3-102846-4. Lewis, Geoffrey (2001). Turkish Grammar. Oxford University Press. ISBN 0-19-870036-9. Lewis, Geoffrey (2002). The Turkish Language Reform: A Catastrophic Success. Oxford University Press. ISBN 0-19-925669-1. Özsoy, A. Sumru; Taylan, Eser E., eds. (2000). Türkçe’nin ağızları çalıştayı bildirileri [Workshop on the dialects of Turkish] (in Turkish). Boğaziçi Üniversitesi Yayınevi. ISBN 975-518-140-7. Soucek, Svat (March 2000). A History of Inner Asia. Cambridge University Press. ISBN 978-0-521-65169-1. Vaux, Bert (2001). "Hemshinli: The Forgotten Black Sea Armenians" (PDF). Harvard University. Archived from the original (PDF) on March 15, 2007. Retrieved 2007-04-24.
Zimmer, Karl; Orgun, Orhan (1999). "Turkish" (PDF). Handbook of the International Phonetic Association: A guide to the use of the International Phonetic Alphabet. Cambridge: Cambridge University Press. pp. 154–158. ISBN 0-521-65236-7. Center for Studies on Turkey, University of Essen (2003). "The European Turks: Gross Domestic Product, Working Population, Entrepreneurs and Household Data" (PDF). Turkish Industrialists' and Businessmen's Association. Archived from the original (PDF) on December 4, 2005. Retrieved 2007-01-06. "CIA Factbook:Iraq". 2013. Archived from the original on 2016-03-03. "Güncel Türkçe Sözlük" (in Turkish). Turkish Language Association. 2005. Archived from the original on 2007-03-12. Retrieved 2007-03-21. "Turkish Etymological Dictionary online" (in Turkish). Sevan Nişanyan. 2006. Retrieved 2007-09-11. "Language Materials Project: Turkish". UCLA International Institute, Center for World Languages. February 2007. Retrieved 2007-04-26. TNS Opinion & Social (February 2006). Special Eurobarometer 243 / Wave 64.3: Europeans and their Languages (PDF). European Commission Directorate of General Press and Communication. Retrieved 2007-03-28. "Turkish Language Association: Sesler ve ses uyumları "Sounds and Vovel karmony"" (in Turkish). Turkish Language Association. Retrieved 2013-01-13. Göknel, Yüksel (2012). "Turkish Grammar Updated Academic edition". Retrieved 2013-01-16. Turkish Language Association. "Türk Dil Kurumu – Tarihçe (History of the Turkish Language Association)" (in Turkish). Archived from the original on 2007-03-16. Retrieved 2007-03-18. "Türkçe Sözlük (2005)'teki Sözlerin Kökenlerine Ait Sayısal Döküm (Numerical list on the origin of words in Türkçe Sözlük (2005))" (in Turkish). Turkish Language Association. 2005. Archived from the original on March 1, 2007. Retrieved 2007-03-21. "Spartak KADIU : Türkçede zaman ve kip kavramı ve i-ek eylemin fonksiyonu üzerine" (PDF) (in Turkish). Turkish Studies: International Periodical For The Languages, Literature and History of Turkish or Turkic Volume 7/3. Retrieved 2013-01-15. Eyüboğlu, İsmet Zeki (1991). Türk Dilinin Etimoloji Sözlüğü [Etymological Dictionary of the Turkish Language] (in Turkish). Sosyal Yayınları, İstanbul. ISBN 978975-7384-72-4. Özel, Sevgi; Haldun Özen; Ali Püsküllüoğlu, eds. (1986). Atatürk'ün Türk Dil Kurumu ve Sonrası [Atatürk's Turkish Language Association and its Legacy] (in Turkish). Bilgi Yayınevi, Ankara. OCLC 18836678. Püsküllüoğlu, Ali (2004). Arkadaş Türkçe Sözlük [Arkadaş Turkish Dictionary] (in Turkish). Arkadaş Yayınevi, Ankara. ISBN 975-509-053-3.